1/2" Diameter. 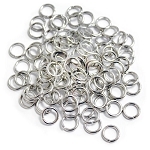 Perfect for charms, scrap embellishments, earrings, mixed media art and more! The Mini Bottle Cap measures 1/2" across the bottom, 5/8" across the top and is only 1/8" deep. 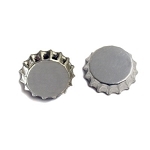 Check out our 1/2 inch Mini Cap Images. Manufactured exclusively for Bottle Cap Co.